MCOLES Certified-Use of 302 Funds approved for Michigan law enforcement agencies. The OpTac International Tactical Command Program, hosted by the Washtenaw Metro SWAT Team, will be held April 23-25, 2018 in Ann Arbor, Michigan. This program provides attendees with realistic guidelines and practical exercises to prepare for and enhance their command of Special Weapons and Tactics teams. 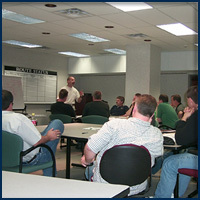 Classroom presentations and tabletop exercises provide a detailed understanding of raid planning and execution, command post operations, legal and ethical decision-making, critical incident management, SWAT fitness, and tactical applications on emergency response operations. An emphasis is placed on the relationship between the selection and training requirements of tactical team personnel, and department liability. The cost to attend the OpTac International Tactical Command Program is $599 per person. There is limited space available, therefore, paid reservations are accepted on a priority basis.